Computer CPU has Thermal shutdown facility to protect the Processor, if the cooling fan fails. But other parts of the mother board, SMPS will be still in the On state. In Inverter, the transformer heat up in over loaded condition and the windings will burn if the Inverter has no over load cut off. 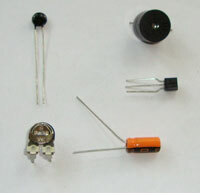 The CMOS power transistors in Amplifier circuit are also susceptible to high temperature. This circuit is reliable and can connect through lead-to-lead soldering and no PCB is required. The main component of the circuit is the Thermister which is a kind of variable resistor and its resistance depends on the temperature in its vicinity. There are two types of Thermisters. Resistance of PTC (Positive Temperature Coefficient) Thermister increases when the temperature increases and that of NTC (Negative Temperature Coefficient) decreases when the temperature increases. Here 2.2 K Thermister is used. At normal temperature (as set by VR1), T1 will not get base bias and buzzer will be off. When the temperature increases, capacitor C1 charges fully and transistor T1 conducts, and the buzzer beeps. You can immediately switch off the device to prevent its damage.Capacitor C1 gives a short lag before the buzzer sounds to prevent false alarm. Connect the Thermister with thin plastic wires and fix it near the heat generating part of the device. Power can be obtained from the power supply of the device itself. Switch on the device and wait for 5 minutes. Then slowly adjust VR1 till the buzzer stops beeping. When the temperature increases, buzzer will beep. If other value of Thermister (1 K – 10K) is used, change the value of VR1 accordingly so as to make the base voltage of T1 less than 0.7 volts in the standby mode.